Ideas, Business, Technology, Hacks, Thoughts, Meta: Microsoft Web Platform Installer v2.0: Fast way for a dev machine! 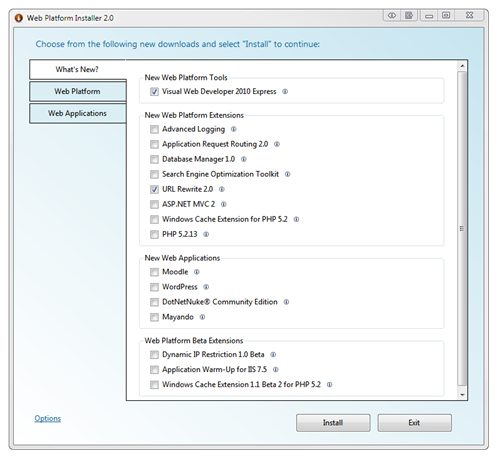 Microsoft Web Platform Installer v2.0: Fast way for a dev machine! The Web PI is a free tool that makes getting the latest components of the Microsoft Web Platform, including Internet Information Services (IIS), SQL Server Express, .NET Framework and Visual Web Developer easy. It is the fastest way to take a machine from fresh Windows install to "ready to dev". It can install everything from .NET 2.0 SP to SQL Server 2008; has several open projects. I was able to install SQL Server 2008 with required service packs, etc. If you would download an open project for instance, that is based upon Perl or Python, it would download it for you along with all of the dependencies. Overall, the performance is proportional to the download speed of you internet connection. "I'm lovin it".